It was a temperate December day in Eureka, California. Alissa Morey, an elementary school librarian, had just returned home from the supermarket with her two young children. She carried the box of groceries into the house while 9-year old Della chaperoned 18-month old Owen. “I set the groceries on the counter,” Alissa says. “I thought the kids would come in right behind me, but they didn’t. Then I heard Owen crying.” At that moment, Della walked through the door carrying her little brother. “He’s bleeding,” she announced. 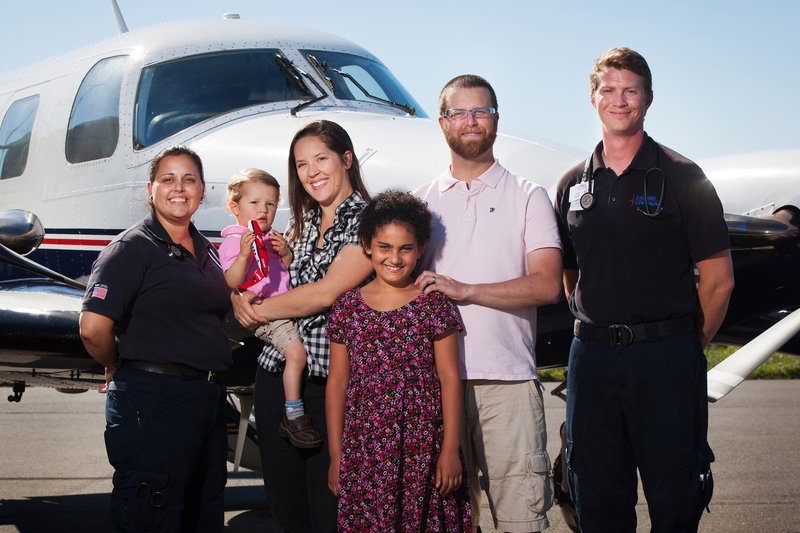 Flight Nurse, CJ Janisse, with Owen, mom Alisa, daughter Della, dad Lehrin, and Flight Paramedic Dan Johnson. As it turns out, Owen had taken his sister on a brief detour after they got out of the car, attracted by a fixed-gear bicycle. He had simply spun one of its wheels…and then touched the chain. Of the three fingers that got caught in the chain, one was more severely injured than the others. “It looked like a tendon was hanging out,” Alissa recalls. Alissa assumed Owen would be flown to the University of California San Francisco Medical Center. The ER physician said, “No, UCSF only does about a dozen of these a year, but there’s a clinic in San Francisco that specializes in finger reattachments.” The doctor emphasized that it was the leading place in the world for such surgeries. The word “reattachments” got to Alissa; she hadn’t thought her son’s injury was that severe. 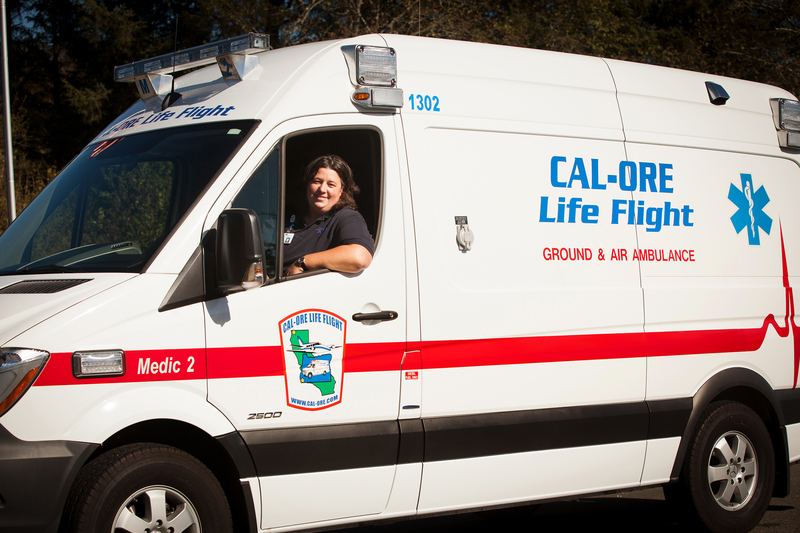 Cal-Ore Paramedic Supervisor Cary Hill transports patients aboard the ambulance. A ground ambulance was at the other end, ready to take Owen and party to The Buncke Clinic. Buncke specializes in plastic and reconstructive surgery, hand surgery and microsurgery..
“When we arrived, I was so relieved,” Alissa says, “but by the time we got there, the surgeon had left.” They were told he would return in the morning. Those were not false words. The next day, Owen’s hour-long surgery went beautifully. There was no nerve damage, and the Moreys were able to take their son home within 24 hours. Owen wore a custom-made cast for about two months to protect his hand while it healed. He recovered beautifully and is doing quite well today. 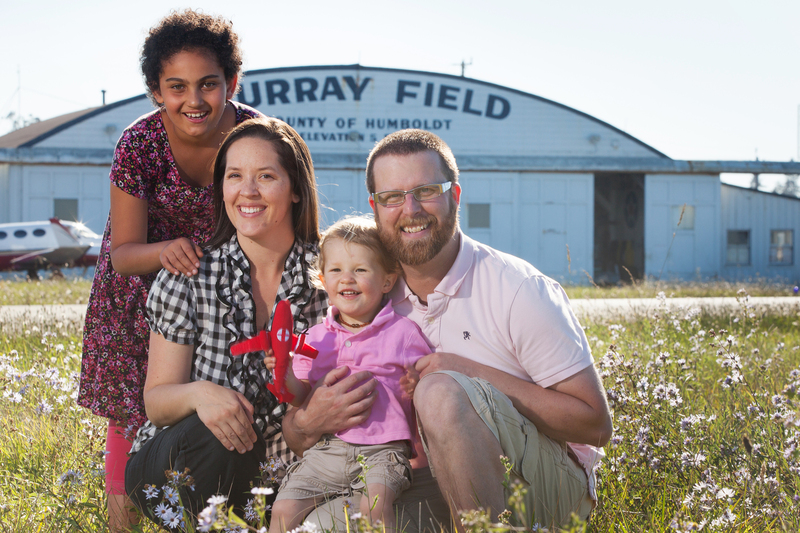 The Morey family, Della, Alisa, Owen, and Lehrin, are all doing great. CJ, Dan and Dave were the absolute definition of caring professionals.